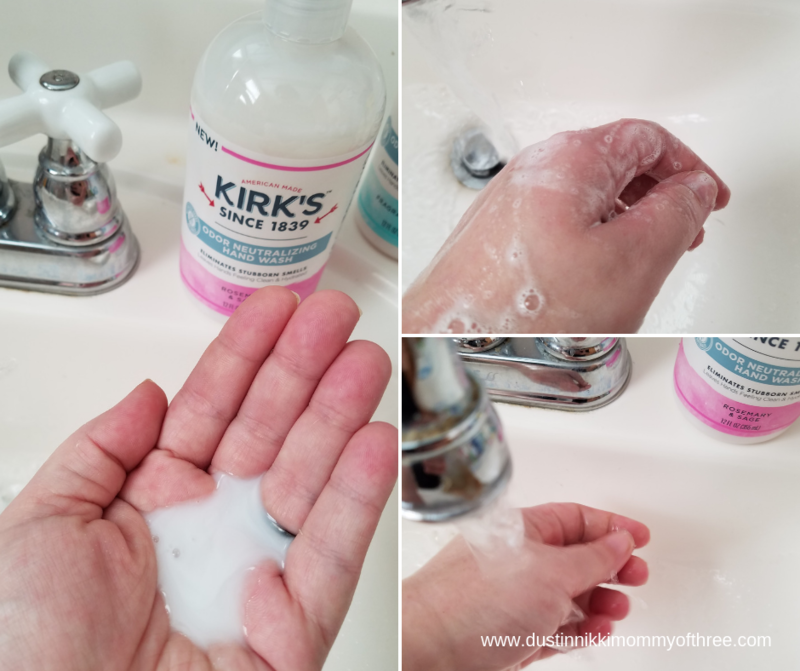 We have been using Kirk’s Since 1839 natural liquid hand soap for a few weeks now. I have a problem with my hands drying out with certain soaps. Sometimes natural soaps are even worse. 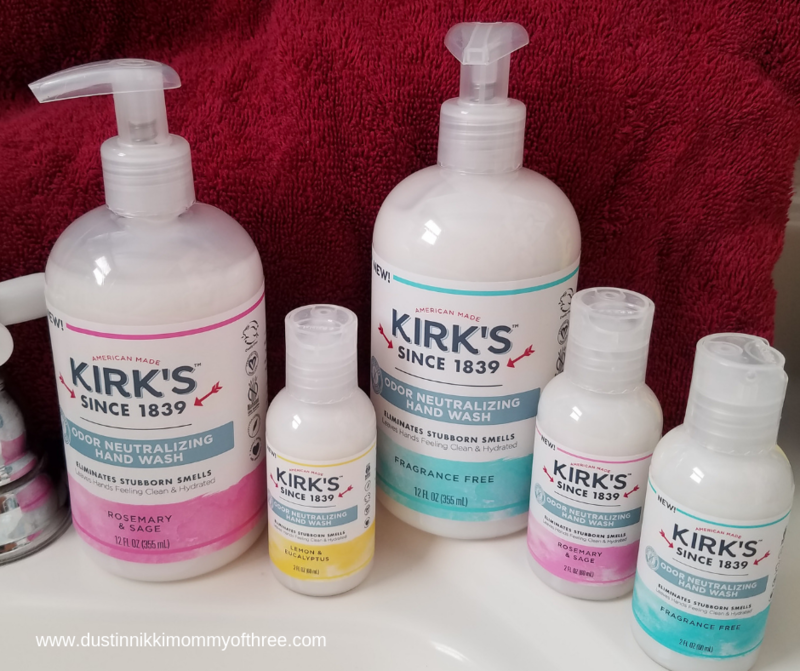 I love Kirk’s because not only does it not dry my skin out, it actually moisturizes my skin. My husband has the same issues that I have and he loves using it too. 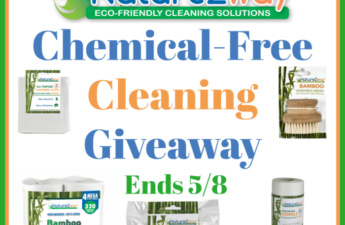 They have an unscented formula and they also have scented formulas as well which are scented naturally. 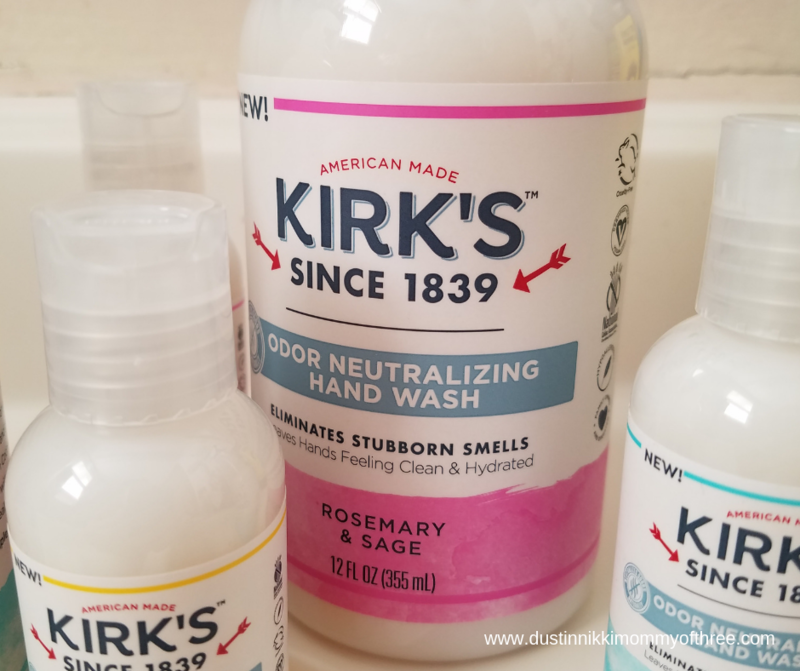 Kirk’s Soap is natural soap. 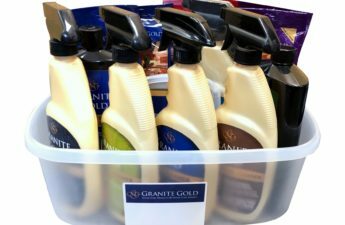 They have liquid hand soap, bar soap and they also have 3-in-1 head to toe cleanser. The liquid hand soap comes in three different scents. There is unscented/fragrance free, lemon & eucalyptus, and rosemary & sage. They also contain coconut oil and aloe vera. Each one is lightly enhanced with essential oils. It’s non-GMO certified, certified gluten free, cruelty free, and certified vegan. It’s also hypoallergenic and family owned. 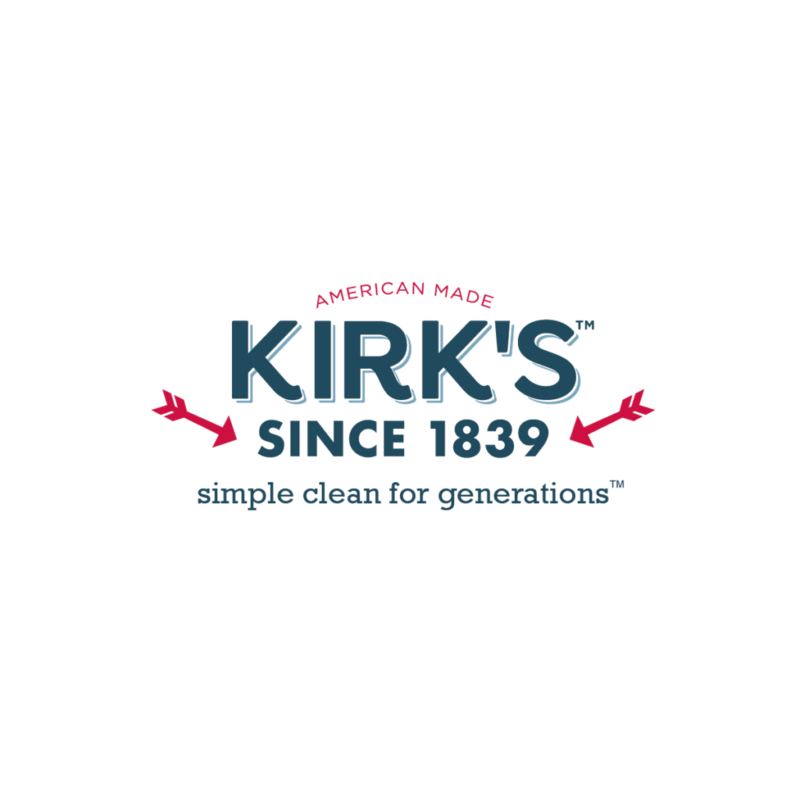 Kirk’s not only cleans well but it also gets rid of smells that like to linger. One of the things that like to linger are car oils, grime and even gasoline. My husband prefers the fragrance free soap so that’s the one he uses most. Usually he has this orange kind of soap that he uses after doing something with the car but he found that Kirk’s works just as good at cleaning the grime off his hands after working on the car. Our son spilled a little gas a few days ago after filling our tractor lawnmower. We have one that has a snow plow we can attach to the front of it to clear our driveway which was what he was doing. Gasoline seems to take forever to get rid of (the smell, no matter how clean your hands are) but when he washed his hands with this soap, the gas smell was pretty much gone. There are certain foods in the kitchen that have smells that are sometimes hard to get rid of too. Things like fish, garlic, or even onions. We very rarely cook any fish since our son has a fish and seafood allergy but I do use fresh garlic and onions in a lot of my cooking. I really don’t like the smell of garlic and onions left over on my hands. Again, no matter how much I wash my hands, the lingering smells are still there. 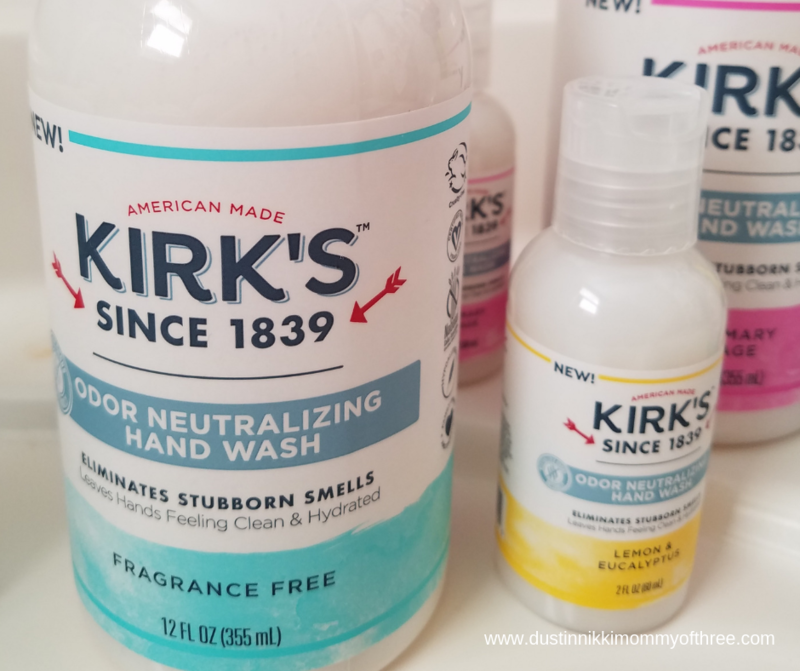 Before we actually started using Kirk’s, I was reading about the kinds of smells it claims to eliminate and I was skeptical. I am naturally skeptical of a lot of things. So much so that when I used this soap to wash my hands after chopping garlic or cutting up onions, I was really surprised that the smells were pretty much gone. I love the formula of this hand soap. It almost feels like a lotion. It lathers well although it’s not a lather that is over the top. Not a whole lot of lather to it. But that’s okay because it does clean well and does a great job of washing away dirt, grime and whatever else you may have on your hands. It rinses off really well too and I am very pleased to say that it doesn’t leave any residue or anything. My skin feels really hydrated afterward too. I love it. 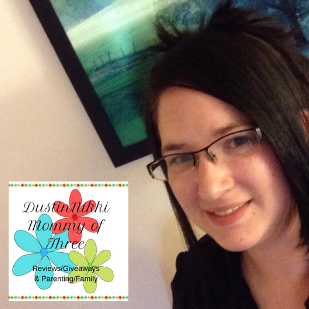 I love it for my whole family. My husband is pretty picky when it comes to soaps too and he really likes it. 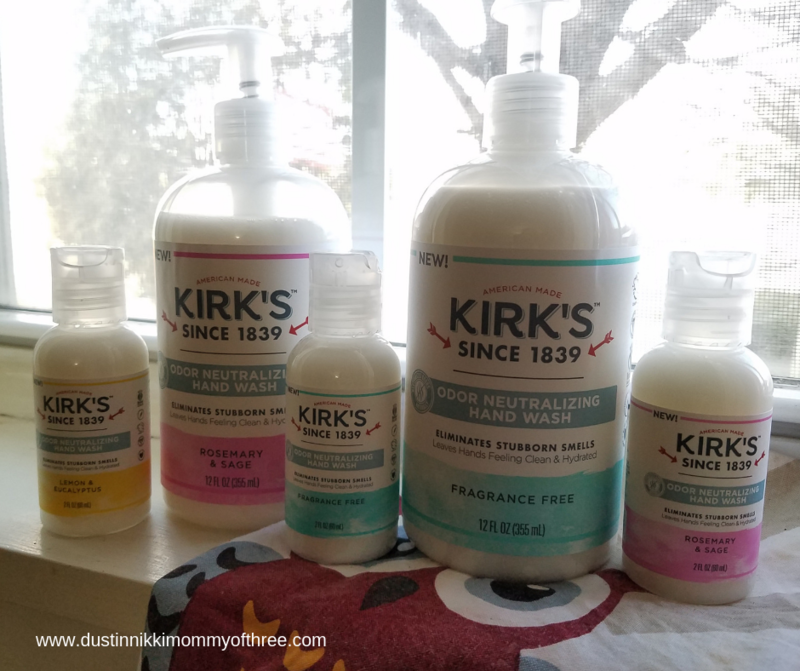 If you want fragrance free, Kirk’s formula is perfect for that. There isn’t a smell to it at all. I really like the lemon & eucalyptus. It has a great scent to it. The rosemary & sage is my favorite though. The scents are not very strong either which I prefer. They are pretty light scents that linger just a little. Love how well this soap cleans, rinses and removes odors. I can’t say enough good things about the way my hands feel afterward either. If you are looking for a natural soap, you might want to check them out! 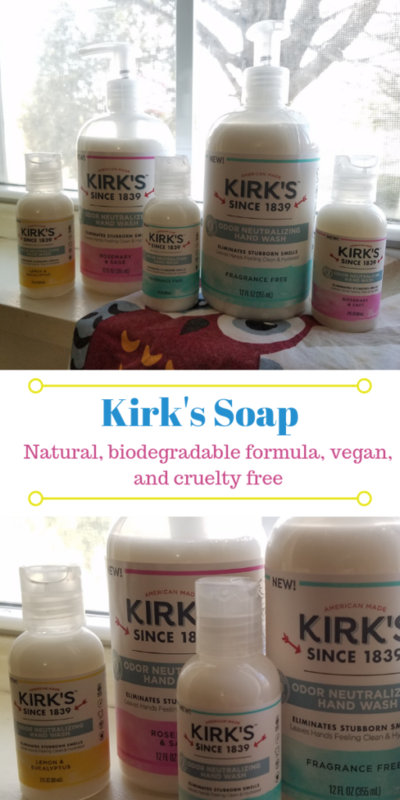 Buy It: You can buy Kirk’s Soap products at stores like Kroger, Giant Eagle, Walmart, and Meijer stores. 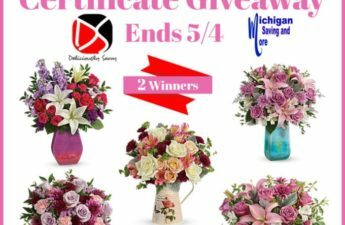 Check out their store locator on their website to see where you can find them near you. Disclaimer: I was not compensated for this post. 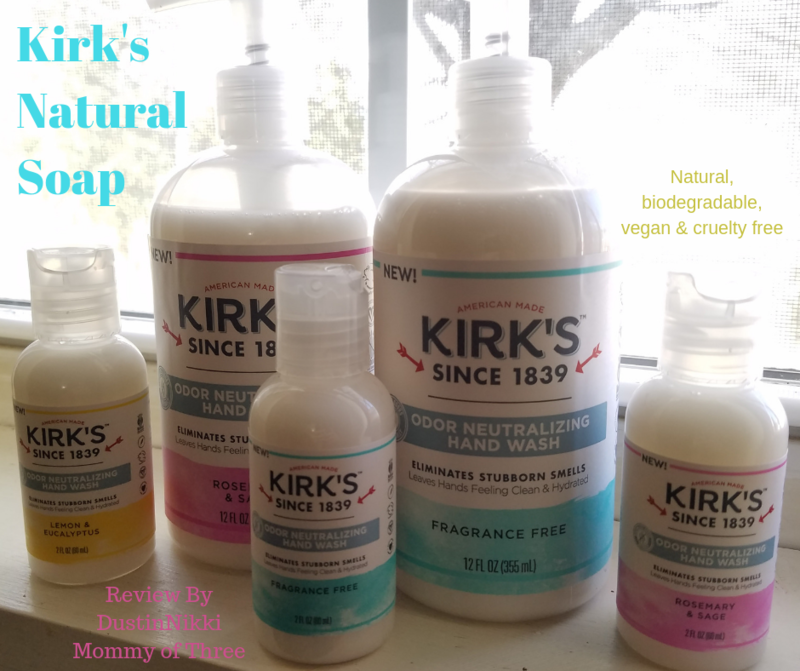 However, I received free product mentioned in this post from Kirk’s Soap in exchange for my honest review. All opinions expressed in my review are 100% my own.